Higher education is expanding, internationalizing, and changing rapidly around the world. Yet, many of the broader international higher education community and funders are unaware that much of what the United States has achieved in quality higher education derives from the student affairs staff. holistic and engaging approaches through student affairs, student development, and student services. This will be of interest to all those who value quality higher education no matter what their role. The intent is to convince broader constituencies of the merit of enhancing the student experience so that students worldwide will benefit from enhanced learning and development opportunities. 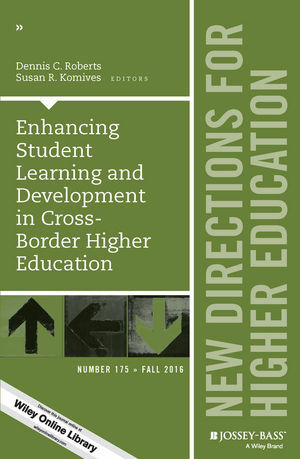 This is the 175th volume of the Jossey-Bass quarterly report series New Directions for Higher Education. Addressed to presidents, vice presidents, deans, and other higher education decision makers on all kinds of campuses, it provides timely information and authoritative advice about major issues and administrative problems confronting every institution. Dennis C. Roberts is an independent consultant who works with colleges and universities to enhance their impact in student leadership learning and international understanding. Susan R. Komives is professor emerita from the student affairs graduate program at the University of Maryland. Best practices in internationalizing student learning and development require cultural critical analysis before transferring, adapting, hedging, or avoiding existing practices in cross-border applications both in and beyond the classroom. This chapter applies a lens of five diffusion models—learning, imitation, competition, normative, and coercion—to understand the motivations that decision makers and implementers use in their specific international context. Predicated on the principles of success and contextuality, this chapter shares an African perspective on a first-year adjustment programme, known as First-Year Village, including its potential and challenges in establishing it. Helping students who were born under China’s 1979 One Child Policy learn to face adversity was the target of multiple programs including “whole person education” during first- and second-year study. This chapter describes a programme of learning and development at the University of Sheffield, United Kingdom, to support looked-after children and care leavers throughout the student lifecycle. Higher education institutions in Mexico provide opportunity for change by educating socially responsible leaders to become civic engaged citizens. This chapter reviews models, theories, and cross-national data on student learning and development and explores these within their context. This chapter explores students interacting in their environments, specifically the influence of culture in student learning and development. Cultural applications in Singapore are featured. This chapter explores the best practices and resources for adopting assessment and evaluation strategies and practices across countries. This chapter explores institutional capacity building in cross-border student affairs and services focusing on human capital and its importance to international higher education within local contexts. This chapter summarizes and extends the conversation of how true partnerships can be cultivated to achieve the deepest impact to enhance student learning and development.